Gov. Dannel P. Malloy presented legislators Thursday with almost $350 million in budget-cutting options that would fall heavily on social services, education and municipal aid, according to documents obtained by The Mirror. In closed-door talks, the Democratic governor also suggested closing a prison, two courthouses and a state police barracks; eliminating advocacy groups for women, children and minorities; and finding another $85 million in still-to-be-identified savings among all agencies and departments. Meanwhile, leaders of the legislature’s Republican minority offered an array cuts as well as new restrictions on state employees’ wages and benefits. The latter would presumably would require negotiations with labor unions. But they also proposed a carrot — incentives to encourage senior workers to retire. State officials from both parties are scrambling to mitigate rapidly increasing deficit projections, both for the current fiscal year as well as the next two. If a deal can be struck, the legislature is expected to return in special session. This fiscal year, which began July 1, is anywhere from $118 million to $330 million in the red, according to forecasts from the Malloy administration, the legislature’s nonpartisan Office of Fiscal Analysis and the Republican caucuses. Meanwhile, nonpartisan analysts this week have identified revenue shortfalls that would leave a $402 million gap next fiscal year and worsen an earlier deficit forecast for 2017-18 — the first new budget after the next state election — from $927 million to more than $1.37 billion. The latter figure represents roughly 7 percent of annual operating expenses. It also matches deficit projections in an earlier budget cycle that led to social service cuts and almost $700 million in annual tax hikes approved this past June. Neither the administration nor legislative leaders would disclose or discuss specific proposals after Thursday’s meeting, but the details were found in the documents obtained by The Mirror. Rep. Toni Walker of New Haven and Sen. Beth Bye of West Hartford, Democrats and co-chairs of the Appropriations Committee, were cautiously optimistic. “It was a good-faith effort,” Bye said. House Minority Leader Themis Klarides, R-Derby, and her Senate counterpart, Len Fasano of North Haven, also said they were happy that everyone seems focused on the long-term. “I think we appreciate the attention they gave to our ideas,” Fasano said, adding that Republicans would look closely at Democratic ideas. Fasano added that the GOP is searching for cost savings that balance the budget over the long haul and respect the priorities of officials from both parties. “I think that’s how you reach a settlement,” he said. Malloy spokesman Devon Puglia, who also wouldn’t disclose specifics of the talks, said the administration would carefully review all proposals from legislators. “We will look for areas of common ground,” he said. 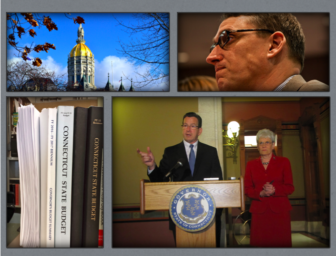 For Malloy, his latest solutions largely echo budget reductions he offered last February, when he proposed a new spending plan for the 2015-16 and 2016-17 fiscal years. The administration Thursday offered cuts worth about $350 million per year. Just over $40 million of them fell on departments involving social services and health care. Lawmakers rejected most of those ideas this past spring. Those include cuts to regional mental health boards, social service programs, grants for mental health and substance abuse programs, funeral and burial funds for poor people, and grants for museums and other cultural programs. It also calls for closing the Department of Social Services’ Torrington regional office, a plan Malloy proposed in February that legislators rejected. Malloy’s plan would privatize 10 group homes that serve people with intellectual or developmental disabilities. The state currently operates 62 group homes that serve 330 people, at a cost of $56 million per year. The majority of people with developmental disabilities who receive state-funded residential services are served by private nonprofit providers, whose facilities tend to cost less than public ones. The change would save $123,641, according to the proposal. Approximately 70 full-time and 55 part-time workers in the state-run group homes would be transferred to fill vacancies elsewhere in the system to help reduce overtime, according to the proposal. Other elements of the governor’s plan include reducing funding for community health centers and school-based health centers, eliminating funding for a program called Project Access New Haven that coordinates donated specialty care for uninsured residents, eliminating money for adult and child asthma programs that are currently funded by money from a settlement with tobacco companies, cutting $1.5 million in grants intended for “community care teams” that work to address the needs of people with mental illness or addiction who frequently visit emergency rooms, and closing the 20 detox beds at Connecticut Valley Hospital in Middletown. The proposal would also reduce funding to mental health programs that received money under the controversial gun control measure lawmakers passed in response to the Newtown school shooting. Those include a $500,000 cut from emergency mobile psychiatric services that help people in crisis in Bridgeport, and a 50 percent cut – $250,000 – to programs in Hartford and New Haven that care for people in the early course of psychotic illness. The governor also proposed eliminating funding for teams of psychiatrists and other mental health professionals who offer consultation to pediatric primary care providers to help them care for children with mental health needs. The program has drawn praise from pediatricians and experts in children’s mental health, and was used 5,133 times in its first year. Malloy also called for cutting $16.5 million in payments hospitals were expected to receive this year to repay them for a tax they pay to the state. The funding – which would have been matched by federal money – was due to hospitals in the quarter that ended Sept. 30 but was never paid. The governor also followed his past budget playbook in recommending almost $21 million in cuts to the University of Connecticut and the UConn Health Center and $7 million to the Board of Regents for Higher Education system. The UConn cut includes billing the university almost $9 million to reflect overpayments to UConn to cover fringe benefit costs dating back to 2003. UConn Provost Mun Choi told faculty during a meeting Thursday that the state’s flagship university has the ability to absorb some cuts without impacting programs since their budget officials set aside some funding at the start of each year in anticipation of cuts. “We prepare for some cuts from the state,” he said. Another $10 million in cuts came from the Department of Education. Open Choice, a program that reimburses suburban districts for enrolling students from Bridgeport, Hartford and New Haven, is cut by $1.4 million. Districts would still be reimbursed for the students they already enroll, as the state budget provided funding for more seats in the program than suburban districts were willing to offer. Malloy proposed cutting funding for charter schools by $2.3 million. This cut is possible because fewer students enrolled in charter schools than the state budget provided. This happened because the State Board of Education approved a smaller expansion of charter schools than initially anticipated. An after school and summer school program for students from low-income families that focuses on engineering would no longer receive state funding. A program that help students who are struggling to read would see a sizable cut. State funding for the Boys and Girls Clubs of America would be eliminated. State funding for a preschool in Bridgeport — ABCD — would be eliminated. Cities and towns also weren’t spared from the budget axe. Communities, which already lost $15 million in non-education grants in September, would lose another $30 million under the governor’s new proposal. This includes $15 million in school transportation grants for public school students. The governor’s plan also would close a state police barracks in Bethany and a prison in Enfield, and eliminate $8.6 million in grants to numerous tourism and cultural initiatives. The administration would ask the legislative and judicial branches to sacrifice as well. Nearly $8 million would come from the legislative branch, including $1.48 million in funding for a half-dozen commissions with vocal constituencies that have saved them during previous budget crises. Malloy is proposing some of the relatively small but politically sensitive budget cuts he attempted soon after taking office 2011, when he was confronted with a projected deficit of more than $3.6 billion. He would eliminate funding for the Old State House, a day care that serves the children of many legislative employees, and the half-dozen legislative commissions. But the commissions, which produce research and often act as advocates, each have their own political constituencies. Malloy, who generally prevailed in his first budget, acceded to the wishes of legislators and left them intact. The Judicial Branch would lose $21 million in a plan that also includes closure of courthouses in Bristol and Meriden. The Republican plan would cut $372 million overall, plus achieve additional savings — if concessions can be negotiated with state employees. The GOP would require the executive branch to find another $93 million in as-yet-undefined savings among all state agencies. It would reduce by $95 million funds Connecticut is supposed to be setting aside now for a new municipal aid initiative. Most of that money won’t be paid until next fiscal year and in 2017-18. The GOP also suggested another early retirement incentive program — something Malloy strongly has opposed because it further burdens the state’s cash-starved pension fund — to save $80 million in salary costs. A controversial change to its corporation tax system on how companies with affiliates in several states must report their earnings would be scrapped. This move would cost the state about $15 million per year in revenue. $10 million through tighter controls on agency overtime accounts. $7.5 million to be saved with 4 percent cuts to more than 100 small line items in the budget. $5 million from greater efficiencies at Southbury Training School. $4.8 million from nursing homes. $4.3 million by eliminating 39 new positions across various agencies. $2.2 million by reducing public grants for state elections. $1 million from legislative franking. $800,000 by consolidating juvenile justice functions at the Department of Children and Families into the Judicial Branch’s Court Support Services Division. But there is the potential to save significantly more than the $372 million already outlined, Republicans say, if state officials can reach a new concessions deal with state employee unions. Requiring all non-hazardous duty workers to contribute 4 percent of their salary toward their pensions. Capping cost-of-living adjustments to future retirees’ pensions. Calculating pensions using only base salaries. This could be very controversial. Unions fiercely resisted earlier efforts to remove overtime earnings from pension calculations. Developing a new, hybrid retirement plan that relies partly on a defined contribution for new workers, similar to the system recently adopted in Rhode Island. Suspending longevity payments for all workers after April 2016. Increasing state employee health and dental insurance premiums by 10 percent. Increasing drug co-payments for both existing employees and retirees. And only granting state employees cost-of-living raises next fiscal year. Most workers also normally receive an annual step increase that reflects their growing experience on the job. The Republicans estimate these changes eventually would be worth at least $107 million per year. And that estimate doesn’t include savings from increased pension contributions and other pension-calculation restrictions. Those savings, GOP documents say, need to be calculated first by pension fund actuaries.